We provide a full range of towing services in Morley, including emergency breakdown recovery, plant & machinery transportation, and the movement of custom/performance vehicles with lowered suspension from home to the race track and back again. In short, if you have a vehicle that needs towing in Morley, we can help. 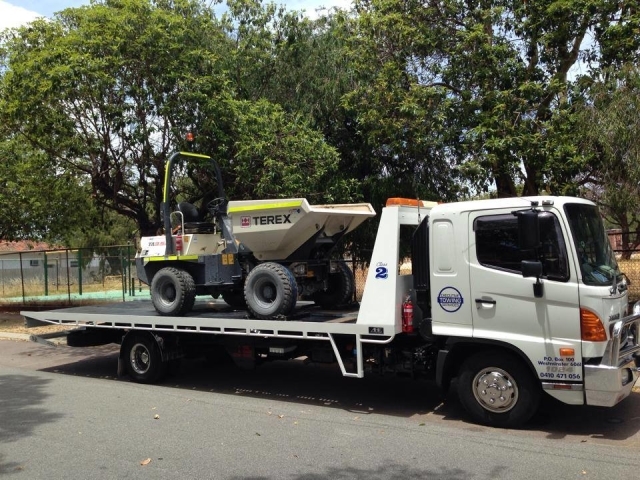 Serving both domestic and commercial customers across Perth, we have built a reputation for reliability, efficiency and the ability to move any kind of vehicle quickly and safely. Whether you have a fork lift that is urgently required on a site across town or your car has broken down and you would like us to tow it to the nearest mechanic, just call 0410 471 056 and we will be happy to assist. As one of the few towing companies in Perth with a current Maritime Security Identification Card, we are able to collect vehicles from the wharf and deliver them to any address in Morley or surrounding areas. We can, of course, also deliver vehicles to the wharf that are being shipped elsewhere. If you would like to find out more about our wharf services, please feel free to call or email whenever convenient and we will provide you with all of the information you need. Our fully qualified and insured tow truck operators are familiar with all the relevant regulations governing wharf deliveries and collections, and will ensure that everything goes smoothly when picking up or dropping off your vehicle. If you need to move heavy plant & machinery from one site to another, Executive Towing Services is the company to call. We can have a tow truck in Morley at your site whenever you need it, ready to load and transport your valuable equipment to its destination. Our tilt tray trucks are designed to carry such loads, our operators are highly trained and we carry comprehensive insurance so you can rest assured that your excavators, bobcats and other machinery will be in good hands at all times while being moved. If you regularly move heavy equipment across the city, please feel free to call and speak to us about our commercial transportation rates: we are sure you will appreciate our competitive pricing structure and our willingness to tailor our services to meet your specific needs. In addition to our standard vehicle transportation services, we also provide roadside assistance to stranded motorists in Morley and adjacent areas. If you should happen to break down in the area and you need to get moving as soon as possible just call and let us know where you are. If we are unable to fix the problem at the side of the road, we will tow your vehicle to your choice of local workshop or service centre. Nobody is more capable or efficient when it comes to towing in Morley: we have the personnel, equipment and experience to meet all of your requirements at very affordable prices so do not hesitate to call and ask for help when you need it.